Nine Man's Murder begins well enough, for this type of mystery novel, as nine former students of Damien Anderson's detective academy receive typewritten invitations for a reunion at Moon's End – and isolated vacation home on a snowy mountaintop in Northern California. There are a string of past incidents described in the opening chapters and they provide a repository of motives, which come into effect when they discover the body of Damien Anderson in an upstairs closet. A knife-handle protrudes from his abdomen. They further discover an obliterated bridge. A cut phone-line and a dead internet connection, which condemns them to spend a couple of days on the isolated mountaintop in the company of an ambitious killer – eager to rack up a respectable body count. So far, so good, but the book doesn't break any new ground for this particular type of detective story. Granted, it's hard to do, but not impossible, because there are examples (e.g. Herbert Brean's The Clock Strikes Thirteen, 1954). Unfortunately, Nine Man's Murder settles on stock-in-trade depiction of the so-called "isolation-mysteries," but that not even my main objection to the book. Because that would've been forgivable. The personalities of the characters resembles that of a group of Easter Island statues, because they're barely indistinguishable from one another and completely unmoved by what's been happening around them – which robbed the story of the mountain tension associated with these isolation-mysteries. A rising sense of terror and growing suspicion are the main ingredients for this type of story. Even if there's a puzzle at the heart of the story. Am I actually defending character-development? Anyhow, my interest was briefly revived when a series of seemingly inexplicable murders began to occur, which include a shooting in an upstairs room when everyone else could be accounted for. Someone else is strangled to death inside a locked bedroom. A potential suspect is imprisoned in the library and the key is sealed away in a separate room, but the murderer was still able to get to the wrongly accused man. I was hoping these locked rooms would be the books saving grace, but I couldn't have been farther from the truth. The explanation for the locked rooms harkened back to one of the oldest tricks in the book and it wasn't even done very well, which annoyed me even further and it was the point that I really began to hate the book – luckily, I had already arrived in the final pages of the book. 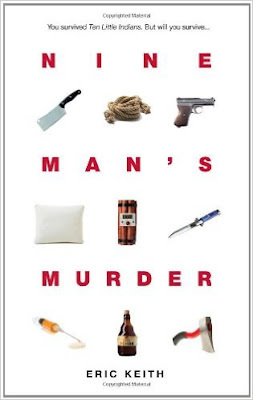 I really should end this review here, but I want to share an alternative explanation for the impossible murders to finish this review on a semi-positive note. There's also a reputation to maintain as the blogosphere's resident locked room enthusiast. So here we go. Well, what if the doors at Moon's End had solid, wood-carved symbols embedded in them, such as a sun on the library door and stars on the bedroom doors, which appeared tightly sunken into the middle of the door, but could be taken out with a (special) nail, pen or stylus. The murderer than could take aim through the newly opened hole in the door and shoot at his victims, which would provide the story with both a red herring and clue. There would be the acrid smell of gun smoke inside the locked room, suggesting the murderer was inside, but one of the trained detectives would notice the shots were very loud – perhaps too loud if they came from behind closed doors inside a locked room. It would also give the murderer more room and time to move around with less chance of being discovered. I fully admit my solution isn’t entirely original either, but still better than what Nine Man's Murder offered its readers and it took me only a minute to come up with it. So, no, I didn't the like the book as a hole. Well, the clueing was decent, but that hardly justifies how the rest of the story was handled/played out. Anyhow, I probably have something a lot better for my next review. I've been doubting myself while reading the book, Sergio, because I remember Puzzle Doc and Patrick positive reviews, but I couldn't find what they saw in the plot. I'd be interesting to see what you think of the book. Maybe I missed something. Kinda surprised you didn't make a comparison with the Decagon House, as you read it recently and it too is inspired by ATTWN. I haven't read this novel (and based on your novel, I'm not sure I will), but I have to say I really like the simple cover art of the book! There were more comparisons I could've made, such as Stout's novella "Too Many Detectives," but they would've only served as examples of when it was done better. That and it would've needlessly padded out the review. The plot has one point of interest for you: there are some plot-points that appear to have taken their cue from The Kindaichi Case Files ("The Phantom of the Silver Screen") and Case Closed (vol. 30) with shades of Detective Academy Q. But, again, dragging these series into the review would’ve been pointless and could've been just a coincidence. So yeah. In short... I wanted to finish writing this review faster than I finished reading the book. I bought this book on the strength of many positive reviews of people whose taste I implicitly trust. But... this is HORRIBLY written. I agree about the characters all of whom are sophomoric caricatures. It reminded me of stuff I used to read in high school literary magazines. Hard to believe that a grown man wrote it. I couldn't get past the first ten pages. Threw it in a box hoping to resell it. I have no desire to pick it up again or ever finish it. I'm dumbfounded by all the raves. I'm sure the similarities to the Japanese stories are nothing but pure coincidence. My guess is the writer has never heard of the "Case Closed" series. That's why I still haven't attempted to write a detective story, because I'm aware that I am not a writer. I do want to give it a shot one day, but I'm sure the responses will be similar to your comment and this review. Oh, well, I'm glad you liked the typo. I'm sure ALL writers make silly typos in their manuscripts. I know I do! And several of them miss my SpellChecker and make it to my blog or my final submitted manuscript. That's why we have editors. Well, that's *one* of the reasons. The typo made me laugh because your review is critical and called attention to holes in the plot, TomCat. I wasn't laughing at you. I thought it almost an intentional pun. Next time I'll not mention something like that in my comment. For the sake of fairness, I just wanted to point out it's easier to critique than to create, because, usually, I try find some balance between the positive and negative aspacts of a novel - which next to impossible to with this one. I also agree that it has similarities to the Kindaichi series, which I am much more familiar with than the Conan series. But that's perhaps because most of the Kindaichi mysteries begin with the premise of a handful of victims stranded on a island/ mountain lodge/ village/ mansion, etc? I've had more time to read these last couple of weeks, which translated in more reviews and hopefully that'll continue for a while. The obvious similarity with The Kindaichi Case Files is, of course, a group of people in an isolated location, but it wasn't the premise. It was the sub-plot about the dead stuntman from the past, which reminded me of one particular volume from Kindaichi. But, as said before, it's probably a coincidence in this case. You're lack of exposure to Carr is worrisome and which Kindaichi case reminded you of my proposed solution? Oh yes, 'the crime in the past impinging on the crime in the present' is a very typical Kindaichi set-up. I have read some Carr, in the following order: 'Green Capsule Mystery', 'Plague Court Murders', 'Emperor's Snuff Box', 'She Died a Lady', 'Till Death Do Us Part'. I liked the puzzle for 'Green Capsule', but found some scenes towards the end overly dramatic. I found much of 'Plague Court' overly dramatic, even slightly weird - and the puzzle wasn't as strong. Which made me somewhat reluctant to pick up more Carr titles, especially when I had 'Green for Danger' and 'Death of Jezebel' sitting on the shelf. But I eventually picked up 'Emperor's Snuff Box', which had it's dramatic moments - but they worked well in tandem with the puzzle. Which encouraged me to pick up 'She Died a Lady' and 'Till Death Do Us Part', both of which I enjoyed. In particular, I found the writing and pacing for 'Till Death Do Us Part' pleasingly strong. I guess like Ho Ling I prefer Queen to Carr? Currently reading, and enjoying, 'Face to Face'. It's the 'The Alchemy Murders', where Kindaichi and friends find themselves stuck in a science laboratory mansion with different rooms named after the Chemical Elements table. And of course, the problem lies with the doors - or, by the least, parts of the doors. I'm always surprised at the almost universal love Till Death Do Us Part receives, because it's not one Carr's most well known novel, but everyone (including me) seems to love it. Since, like Ho-Ling, you blasphemously prefer Queen to Carr, I'm not entirely sure which novel to recommand. He Who Whispers? The Judas Window? The Four False Weapons? Maybe some of the classic historical novels such as The Bride of Newgate, The Devil in Velvet or the massively underrated Captain Cut-Throat. I'll never understand why some mystery readers find it hard to warm to JDC. I guess The Alchemy Murders is from the more recent incarnation of the series? But I haven't read it. For me, 'Till Death Do Us Part' has an interesting premise of a love-triangle that is engagingly worked out as part of the mystery plot. Gideon Fell is, as always, humorously absurd, but not to the excessive degree of some scenes towards the end of 'Green Capsule'... Which was nevertheless still better than the convoluted passages that I stumbled through while reading 'Plague Court'. Come to think of it, I have read 'Judas Window', after 'Plague Court' and before 'She Died a Lady'. The writing was much better than that of 'Green Capsule' and 'Plague Court', but I wasn't sure I enjoyed the puzzle much more than I did for 'Green Capsule'. Nevertheless, it certainly marked the beginning of the upward curve for my impression of Carr. I tend to save the best for the last, and as such the following titles are sitting on the shelf: Carr's 'Hollow Man' and 'He Who Whispers', next to Queen's 'Greek Coffin', 'Siamese Twin' and 'There Was an Old Woman'. I do think Queen has his (their?) problems, and with the marked increase in my enjoyment of the last two Carr novels I read, perhaps the gap between Queen and Carr is getting smaller? It all depends on whether or not 'Hollow Man' and 'He Who Whispers' live up to their praise as the two best Carr novels - and whether or not they supersede 'Greek Coffin', etc. Since we're drifting further and further away from Keith, and towards Queen and Carr, I might as well add that I've just finished Queen's 'Face to Face', which was good - possibly even very good, but not great. Definitely better than 'Egyptian Cross' and possibly 'Cat of Many Tails', but not 'French Powder'. P.S. Yes, 'The Alchemy Murders' is one of the newer titles written by Amagi and not Kanari. Based on the positive reviews I have read, this one is on my wishlist but considering that neither you nor John are impressed by it, perhaps I'll not be too disappointed if I am unable to get it. As for your solution, I think it's lovely. And supported by the book, too: "Inside they found the same attention detail...ornate carvings in the banister of the staircase..."
How I wish Keith had gone with a solution like yours. Then there would have been at least one saving grace to the damn book. Thanks, Karl. Looking forward to read you rant about this thoroughly bad detective story!